impossible in Tacoma. Then, after trying all the motels, and being turned down, we finally were able to rent a little trainer, about 4 miles from my hospital. And Helen, its the cutest thing. Kitchen, compact, with comfortable cushioned breakfast room. Then a living room which opens up into a bedroom at night. All compact with lots of closet space, curtained small windows, lots of electric lights all over the place, cosy, cheerful and we love it. No, I can't find a thing to complain about these days. I'm quite happy. Now, how about you? 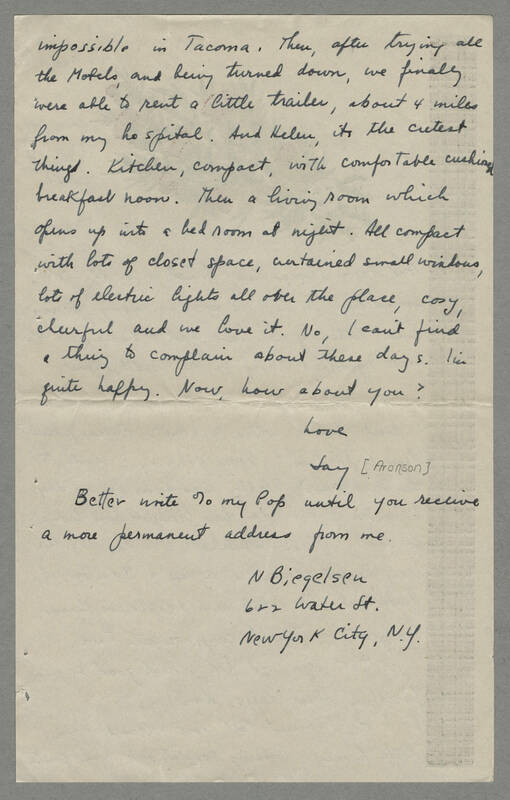 Love Jay [Aronson] Better write c/o my Pop until you receive a more permanent address for me. N. Biegelsen 622 Water St. New York City, N.Y.